Oscar is a sassy, connected chatbot who enables you to easily interact with GitHub projects! Our enthusiasm for working together as a team on a new open source project was the inspiration for Oscar. We loved the idea of an 'open source buddy' who would help you out while you are working on projects. Oscar would be part of the team, helping out by giving information on your project and helping you with common tasks like opening issues, forking or checking for pull requests. 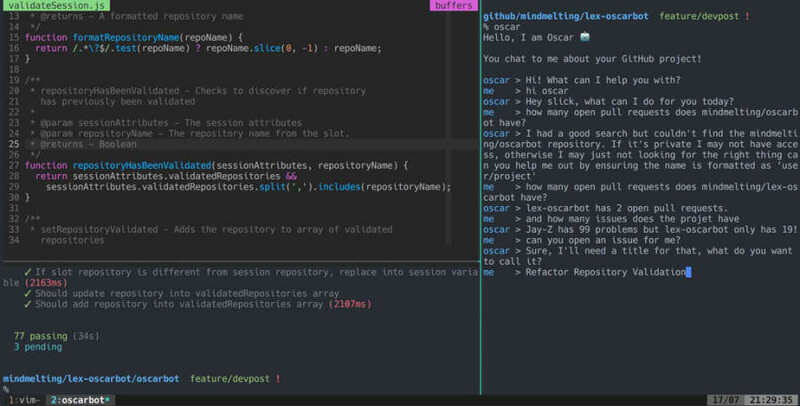 Oscar is a chatbot that interfaces neatly with open-source projects on Github. 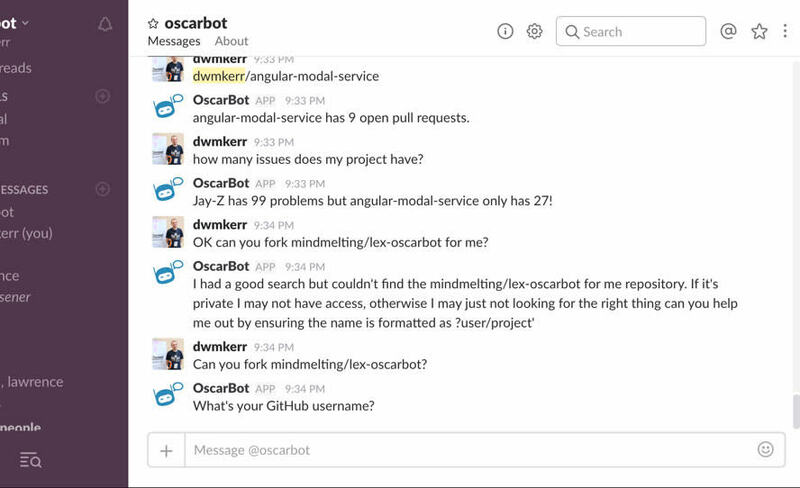 You can bring Oscar into your team channel on Slack and he'll help you get information on your projects and perform common tasks. For terminal nerds, you can even run Oscar through a command line interface so that you never have to leave your terminal window! Oscar runs as a single lambda function. When a request comes in, we match it to an 'intent function'. Most intent functions interact with GitHub in some way, calling either the REST API or the new GraphQL API. Data which is relevant to a user for more than one intent, such as the project you are currently discussing, lives in the session. Other data is elicited as required in the intent function. That's it! The scripts will create any new slots needed, or update them if you changed them. It'll create the new intent, publish it and rebuild and publish the bot. You don't need to do any work in the AWS console. When the make deploy command completes, your bot is ready. Just run the oscar command to start chatting to Oscar (run make cli if you haven't built the CLI yet). Lex slots are challenging to get to grips with, and also required a considerable amount of training values for it to start to recognise what a Github project name looks like. It is very difficult to set up slots which can have wildly varied inputs. For example, a slot which might contain a description for a new issue might be a few characters or many dozens of words. Context can be difficult to maintain. A user might ask 'how many issues has my project got', then ask 'and how many stars?'. In between the two intents we need to preserve the project they are working with. The biggest challenge is that Oscar is essentially a natural language interface to a very large API. The number of things people could ask Oscar is huge, because his purpose is very broad. We actually used Oscar while developing him. When we found bugs, we'd raise issues by chatting to Oscar! The 'conversational' intents, which add a little flavour, and were added after seeing what random things friends asked the bot. The testing. We pick up most bugs very quickly in our unit tests. The deployment scripts, which automatically handle creating, updating, versioning and publishing slots, intents and bots. 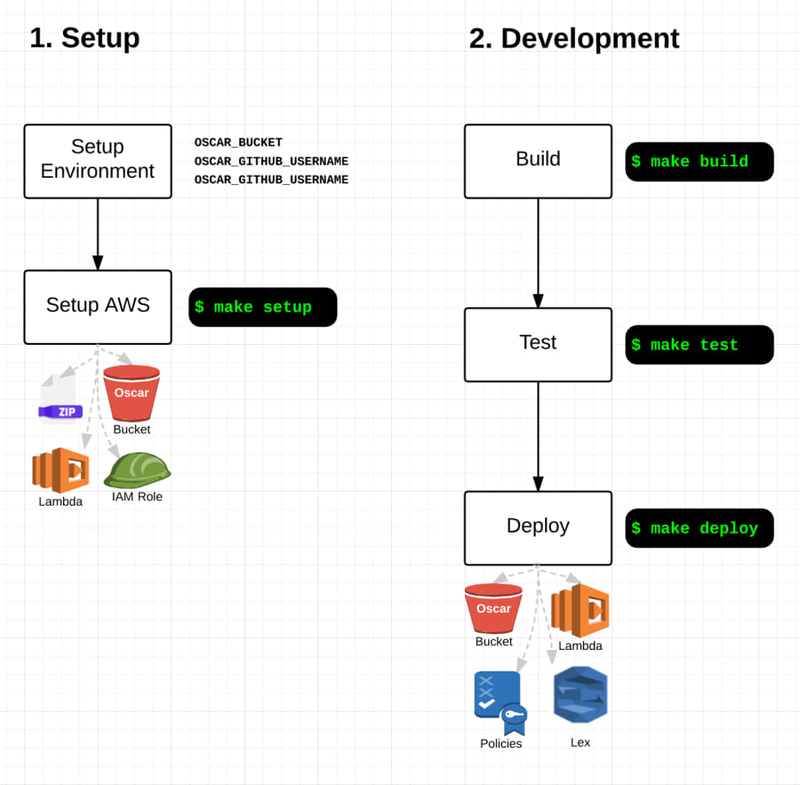 The CI/CD pipeline and make commands, which make the developer experience smooth. The CLI, which provides a very fast way to interact with Oscar. Lots about how AWS Lex works as a platform! How difficult it is to really anticipate how people will interact with a bot. ...but you still need a lot of manual testing to cover the different ways people speak! We've got a big backlog of intents to add! 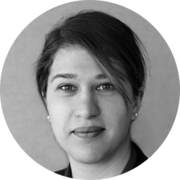 Creating a 'start kit' version of the project so that other devs can leverage the CI/CD and test patterns to bootstrap their own projects quickly. We'd like to find a way to make authentication seamless, so Oscar can easily do things on your behalf (without requesting credentials). Moving the bulk of the code to promises rather than callbacks, to make things a little more consistent. I worked on the making OScar Sassy...scripting, imagery and testing! I worked on creating intents, the project video, and general all round team motivation. I've worked on intents, scripting, and lots of tests!